The colorful paper and ribbon can be recycled for decoration. More than 150 million roses are bought by gardeners in the U.S.
George Washington, the first president of the U.S., was the first breeder of the rose in the country. 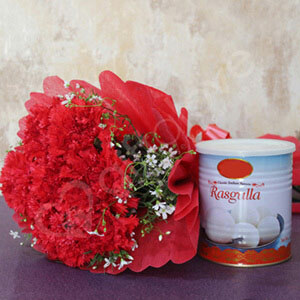 Express your affection in truest way possible with this lovely flower bunch and delicious sweet combo. Your dear one is sure to feel very delighted because of your thoughtful gesture of finding the gift combo as a way to surprise them on a special or memorable day. very satisfactory puchase. The flowers were very beautifully packaged in a bouquet. The gulab jamun was also nice.